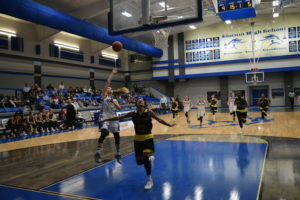 SLOCUM – The Slocum Lady Mustangs were held nearly scoreless in the second quarter of play but came roaring back to capture a 48-42 win over the Timpson Lady Bears in the third game of the Slocum Showcase held on Tuesday, Dec. 19. The game opened with the home town favorites taking a 13-11 lead over the Lady Bears after the first eight minutes of play. The Lady Mustangs were led by Jessi Ives with six points in the quarter. Jalyn Fletcher had three while both Taylor Clark and Laney Lasiter added two apiece. Timpson was led by Ja’karia Deckard and Jasmine Rogers with four points apiece. Laiton Braddock added two and Brylee Behrans chipped in a free throw to account for the Lady Bears’ first quarter point total. As the second quarter got underway, the Lady Mustangs’ shooting went ice cold. Clark was the only Slocum player to score in the period as she knocked down a three to keep the Lady Mustangs within shouting distance. Meanwhile, the Lady Bears took full advantage of the Slocum shooting woes as they went on 10-3 run to take a 21-16 lead to the locker room at halftime. Deckard dropped in seven and Behrans knocked down a three to close out the half. After the break, the Lady Mustangs rallied to tie the score at 32 after three periods of play. 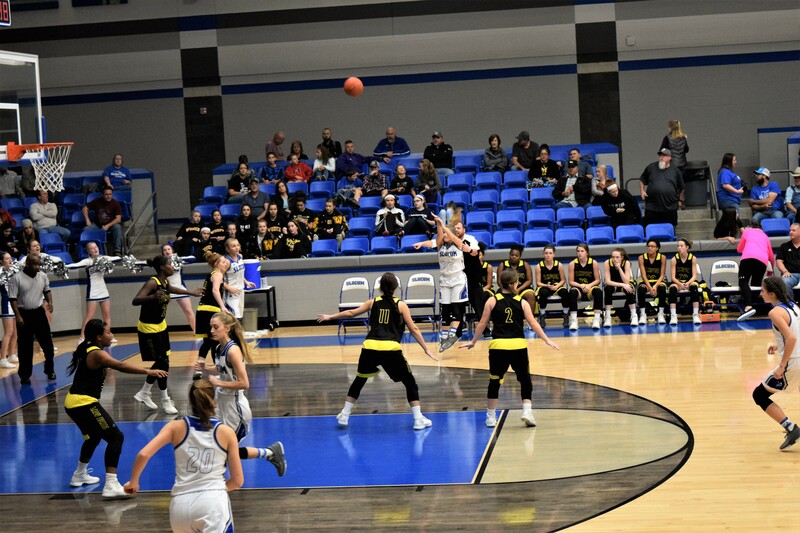 Shelby Bowman connected on two three pointers while Briley Evers netted a three of her own to go along with a free throw. 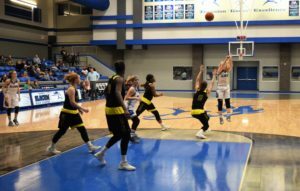 A trio of Lady Mustangs – Fletcher, Ives and Lasiter – combined for the remaining six points as the game headed to the fourth quarter. The Lady Bears were led in the third by Behrans, Deckard and Sara Duke with three apiece while Rogers scored two to tie things up with eight minutes remaining in the contest. With the score tied at 32, the Lady Mustangs ratcheted up their play on both ends of the court. Gina Lively dropped in a pair of three-pointers as the quarter got underway. Ives had four, Bowman nailed a three and Fletcher sealed the deal with a two to give Slocum a hard fought 48-42 win. Timpson got five points from Behrans, three from Rogers and a pair of free throws from Braddock to round out the quarter for the Lady Bears scoring. For the game, Timpson was led by Ja’karia Deckard with 14 and Brylee Behrans with 12 points. Jasmine Rogers dropped in nine while Laiton Braddock had four and Sara Duke added three. The Lady Mustangs were led by Jessi Ives with 12 and Shelby Bowman with nine points. Jalyn Fletcher knocked down seven, Gina Lively had six and both Taylor Clark along with Laney Lasiter had five. Briley Evers closed out the Slocum point production with four points.